Laws Change. People Die. The Land Remains. who reflect on how our actions impact the landscape. Laws Change. People Die. The Land Remains. is an exhibition of paintings and sculpture by five Western Massachusetts artists who reflect on how our actions impact the landscape. The exhibition title is from a quote by Abraham Lincoln: A nation may be said to consist of its territory, its people, and its laws. The territory is the only part which is of certain durability. Laws change: people die; the land remains. The curators selected artists whose work is aligned with this underlying spirit: The land is resilient. It will flex and reconfigure, and it will persist. The landscape of Western Massachusetts has long been a magnet for artists: from Thomas Cole to the artists of today. The resulting artwork provides a lens for us to see the cultural and political changes that continue to shape the region. Sally Curcio’s sculpture of the Western Massachusetts’ landscape captures the aerial perspective of the historical maps of Northampton that feature the Connecticut River and the surrounding valley. Sally Curcio is currently completing two large commissioned Bubble sculptures for the Hassenfeld Children’s Hospital (Eastside) N.Y.C., scheduled to open May 2018. She has exhibited her work throughout the United States and internationally. Curcio’s work is in the permanent collections of Smith College Museum of Art and the Fitchburg Art Museum. She has exhibited her work at the Peabody Essex Museum and the Bruce Museum. In 2017 she received the Massachusetts Cultural Council Finalist Fellowship Grant. Karen Evans received a B.F.A. in painting from Philadelphia University of the Arts. Her primary medium is oil paint with a focus on the reflection of light observed in skies, trees and fields, and water. 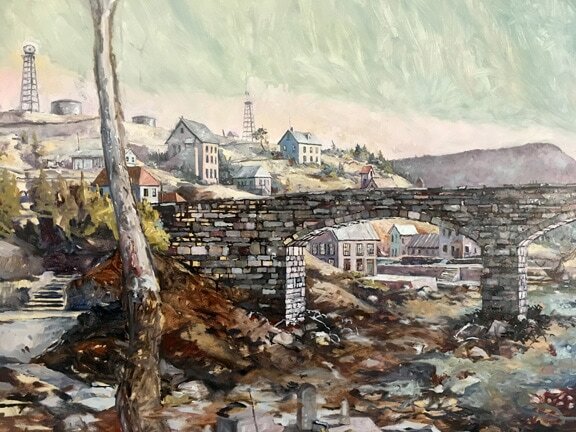 She is a member of the University of Massachusetts Hampden Gallery Critique Group, the Bernardston Meetinghouse Painting Group and the Deerfield Valley Arts Association. Jenny Tibbetts was born and raised in the U.K. She received an M.A. and M.F.A. from University of Massachusetts Amherst and an undergraduate degree in Studio Art from Southern Connecticut State University. She has taught at the University of Massachusetts and other schools and her award winning paintings have been exhibited in solo and group exhibitions throughout New England. 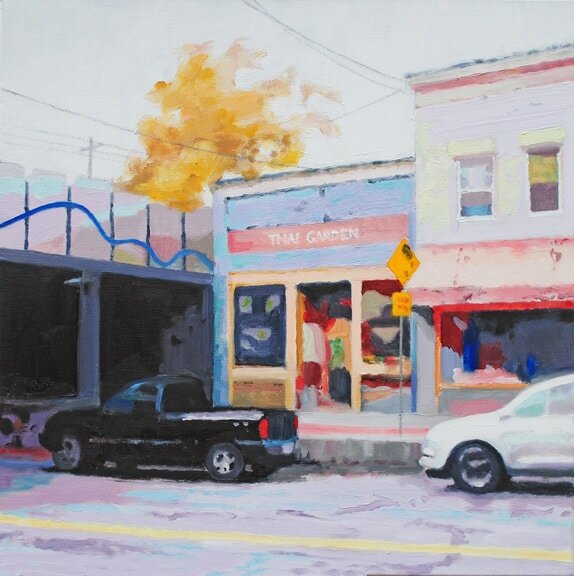 Jesse Connor works from his home studio in Leverett, MA, focusing on painting and drawing. His subject matter includes compiled or invented landscapes that reflect New England’s industrial and agricultural past. He has exhibited in Cameroon, West Africa, Berlin, Germany, Key West, Florida, Ann Arbor, Michigan, and in various venues in Massachusetts. Connor currently teaches at Springfield Technical Community College and Mount Wachusett Community College. He has also taught a variety of drawing, painting and printmaking courses at the University of Massachusetts and Bennington College. Anne LaPrade Seuthe holds an M.F.A. from the University of Massachusetts. Her public and collaborative projects include: SUPERnatural, at AIO 2015; X Marks the Spot, DUMBO Arts Festival, Brooklyn, NY; Intrude 366 at the Zendai MoMa in Shanghai, China; Physical Geography/Psychological Landscape, Goethe Institute in Dresden, Germany and at the Distillery Gallery, Boston, MA; The 2008 London Biennale with TCE Boston, and The Coaster Project at the Fuller Museum.